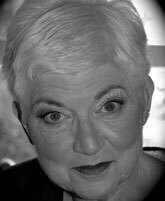 Phyllis Jane Rose, who has directed more plays and musicals than one can count and has been in on the ground floor of many new theaters, performance art pieces, and radio shows, now lives and works in Adelaide, South Australia. Currently she is the artistic director of No Strings Attached, a theater with and for artists with disability. “Sisters” was created in a workshop where Phyllis was asked to create a digital story about something that meant a lot to her. She decided to tell the story about her sister and herself as a kind of apology for being a rather mean older sister. She was drawn, she says, to the strictness in the construction of this form of storytelling: two hundred and fifty words, a dozen or so pictures, and no longer than two minutes. Her teacher informed her that digital stories are a bit like sonnets—multimedia sonnets from the people. We at Persimmon Tree agree with her. The juxtaposition of the sisters’ photos as adults and the story of them as children is surprising and complex, like holding their whole life in a single moment. We’re proud to be the first online magazine (as far as we know) to introduce this form of digital storytelling to our readers. Enjoy! View More: Next piece "Old Woman, New Poems", Home, Archive.